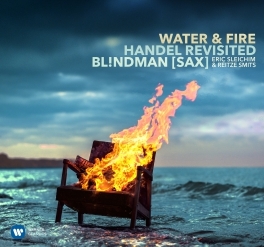 Eric Sleichim (leader of BL!NDMAN) and Dutch organ player Reitze Smits arranged the Water Music suite and Music for the Royal Fireworks for saxophone quintet BL!NDMAN [sax] + Eric Sleichim (here again on alto) and grand organ. Saxophones and organ have been combined several times in new music before and their sounds and dynamics mix splendidly. The monumental character of Handel?s orchestral score is emphasized in this unique instrumentation. Handel’s iconic orchestral suites flank the opening movement of Jean-Féry Rebel’s Les Elémens, a musical punch-in-the-face long ahead of its time, and Olivier Messiaen’s Le Verbe, excerpt from La Nativité du Seigneur.